Things change. This idea is daunting, and never stops being true, but when it comes to calibrating instruments that watch over the Earth's surface, there needs to be a visually consistent object… and that is the Moon. Having the Moon allows instruments to ensure the environment data taken of the Earth is of excellent quality and, more importantly, reliable. While the surface of Earth continues to evolve, the face of the Moon has stayed the same for millions of years. Barring the occasional meteroid impact, the face of the Moon has remained virtually unchanged, thus making it the best candidate when it comes to configuring these instruments. A European Space Agency (ESA)-led project now has plans to increase the Moon's practicality. For this reason, a team of scientists have taken to the slopes of Mount Teide, Tenerife, Spain, escaping the clouds and airborne dust in order to watch the Moon. Fitted on top of Mount Teide is an instrument designated to measure nightly variations in moonlight, which will improve the accuracy of lunar calibration efforts in the future. 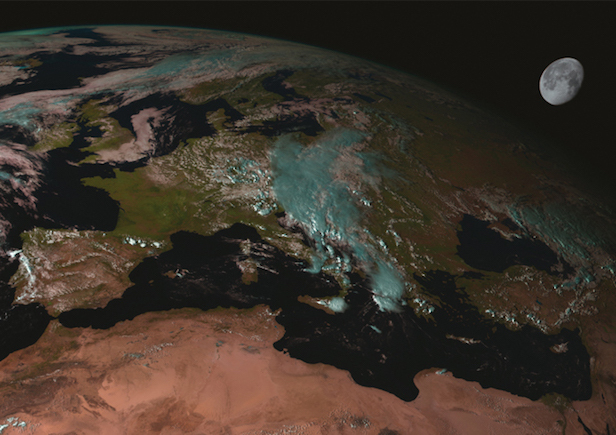 "Space agencies across the globe use the Moon to assess and monitor the calibration of optical Earth observation instruments," explains Marc Bouvet, overseeing the project for ESA. "These instruments are carefully calibrated before launch, but in space their performance can gradually drift, due to radiation or lens contamination for instance, or mechanical changes. "We need to be sure that changes in the light received from Earth represent genuine changes on the ground versus changes in the instrument. Accordingly, we need calibration targets – representing an unchanging, stable light source – to pinpoint any performance drift in space instrument measurements." There are missions that use internal calibration devices, and there are others that use relatively unchanging terrestrial features such as bland, plain stretches of desert, ocean or salt flats for such configurations. From this ESA-led project researchers can model the radiation coming from these targets, but the issue with calibrating from Earth is that the land can still vary over time. "Compared to anywhere on Earth, the surface of the Moon is changeless," adds Marc. "So a wide range of Earth-observing missions use it for monitoring the stability of their calibration, whether from low-Earth or geostationary orbits. "The main issue, wherever we are looking from, is that the Moon we see isn't always the same Moon. It doesn't have a neatly circular orbit around the Earth – neither does the Earth around the Sun – and across every 28 days of the lunar cycle we don't always see exactly the same face: sometimes we see more to the sides, or on top – known as lunar libration. "In fact, it takes 18 years for the Moon to return to the way it appeared before the present. "Our objective is to observe the full disc of the Moon across a two-year period to be able to create a model of lunar radiation that is much more accurate. Today's best modelling effort has a 10 per cent uncertainty associated with it; we want to be able to get that down to around 2 per cent." A solar photometer now sits on Mount Teide. This resembles the global network of photometers measuring the particles in the atmosphere. What makes this instrument different is that it has been carefully designed to work during the night-time, measuring the intensity of the moonlight. Having being backed by ESA's Basic Activities initiative, the project is being handled by a consortium that includes the UK's National Physical Laboratory, Spain's Valladolid University and Belgium's VITO, the Flemish Institute for Technological Research. "Last year there was a conference on lunar calibration, including participants from NASA, NOAA, French space CNES, Japanese space agency JAXA and China," adds Marc. "There was a lot of excitement about this project – as well as comparable US and Chinese efforts – because success would lead us to being able to link past, present and future optical Earth-observing missions to a common calibration reference, allowing easier cross-comparisons of data and enriching our overall picture of the terrestrial environment. "We hope the improved model could be ready for use by the end of the decade."